​Time spent tracking and observing, at close quarters, a family of the world’s last remaining mountain gorillas is simply unforgettable. Time spent tracking and observing, at close quarters, a family of the world’s last remaining mountain gorillas is simply unforgettable. The mountains and volcanoes of Rwanda’s Parc National des Volcans, world famous for the work conducted there by Dian Fossey, are home to some of the world’s last remaining mountain gorillas and you’ll have two days tracking included in the programme. Tracking is conducted in small groups of no more than eight and a good level of general fitness is recommended. Low Season: From $9,930 per person twin share. High Season: From $11,385 per person twin share. Arrive into the Rwandan capital, where you are met and transferred to your hotel. 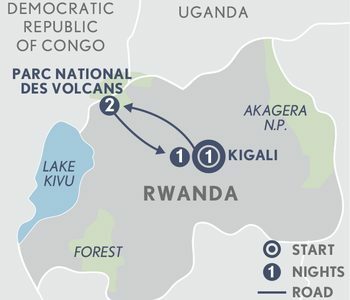 Day 2: Kigali – Parc National des Volcans. A guided introduction this morning to Kigali. See the craft centre, the Kandt House Museum of Natural History and the memorial for victims of the genocide of 1994, a moving experience. Make a short stop for refreshments and a briefing before driving to Sabyinyo Silverback Lodge in the Parc National des Volcans, offering stunning views of the Virunga Volcanoes and only minutes away from park headquarters. Day 3: Parc National des Volcans. Protecting the Rwandan side of the Virunga volcanoes, a range of six extinct and three live volcanoes which shelter some of the last remaining mountain gorillas in the world, this park gained world notoriety for the work Dian Fossey conducted here. After an early breakfast, drive to the Volcanoes National Park Headquarters where you are allocated a gorilla tracking group. After a briefing by your gorilla tracker/guide, the adventure begins. Today’s hike may take anything from one to five hours to reach the gorillas depending on the location of the family. You’ll walk through farmland, bamboo forests and rainforest. Upon sighting the gorillas, stay with them for a magical hour as they go about their daily habits, feeding, foraging, playing, resting and tending their young. Afterwards, return to base where your driver awaits. Lunch is back at the lodge and this afternoon enjoy a scenic drive to view the twin lakes, Ruhondo and Burera, with the spectacular backdrop of the Virunga Volcanoes. Day 4: Parc National des Volcans – Kigali. Today is another opportunity to head into the park in search of the mountain gorillas. You will most likely be allocated a different group, the terrain may vary but the experience will certainly be unforgettable. After lunch, return to Kigali and later enjoy dinner at a local restaurant.